Looking for a way to brighten up the bathroom? What could be better than the vibrant colors of the Union Jack to fancy up the loo? 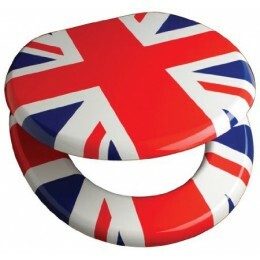 This colorful, unique toilet seat features the Union Jack on the lid, and the design is repeated on the hygienic ring beneath. It's a fun, unexpected piece that is sure to start conversations after guests return from doing their business in the bathroom. A unique choice for the powder room, master bath, guest bath or kids' bathroom, the toilet seat has a distinctive retro look and a slight gloss on its finish to add to its appeal. Crafted out of MDF, the toilet seat is a high quality product that will stand up well to frequent use, so it's a perfect choice for bathrooms that are used daily by the family. Easy to clean, the seat is perfectly sized to fit onto most standard sized fixtures. The hinges are chrome-plated for added shine and to improve durability.